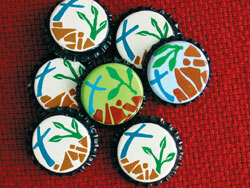 These pins imprinted with the LWF Tenth Assembly logo represent a special sign of "Healing for the World." Either Elisabeth Lunga or Margaret Majo painted these ornamental pins made from a bottle cap. They met in the early 1990s in a home economics course organized by a social worker in Zimbabwe’s capital Harare. An instructor noticed the women’s artistic talent and encouraged them to start decorating bottle tops. They wash each cap, apply several layers of paint, including the base and background color, paint the artwork, apply varnish, and attach the pins to the bottle tops—their full-time occupation! These ornamental pins are a symbol of partnerships in the Lutheran communion that are aimed at breaking the cycle of poverty through sustainable development—from rural agricultural projects to small businesses in urban areas. The women’s work is supported by Zimbabwe’s Lutheran Development Service (LDS), a recently localized operation of the LWF Department for World Service. The LDS now operates as a related organization of the Evangelical Lutheran Church in Zimbabwe (ELCZ). The ELCZ has 110,000 members. It joined the LWF in 1963. Similar pins in different colors bearing the LWF Tenth Assembly logo are currently being distributed throughout the communion. They will be made available in Winnipeg.